More than 50 NBA scouts showed up to the Barclays Center in Brooklyn, New York to watch LSU small forward Ben Simmons and Marquette power forward Henry Ellenson duke it out. Both players made the scouts’ trip well worth it. Freshman Ellenson scored 16 points and pulled down 11 rebounds, while fellow freshman Simmons put up 21 points, grabbed 20 rebounds and dished out seven assists. Ultimately, though, it was Ellenson’s Marquette team that prevailed 81-80 for Marquette’s first win over a ranked opponent since March 2013. 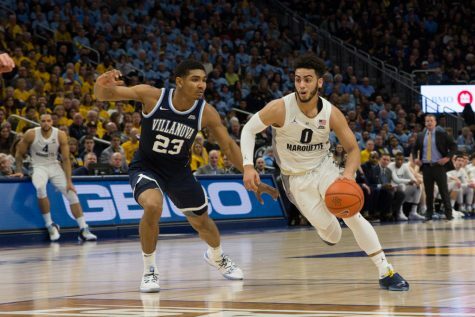 Marquette entered this game coming off its worst home loss in 24 years – an 89-61 shellacking against Iowa – and immediately made a statement with a 10-0 run to open up the game; a run keyed by two smooth buckets from Ellenson. 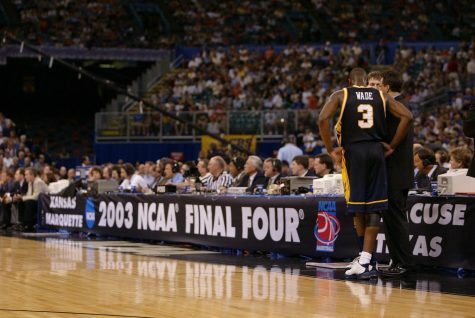 Even though LSU closed the gap quickly with a six-point run of their own, Marquette largely maintained defensive integrity and held on to the lead throughout the entire first half, taking a 36-34 advantage into the locker room. Redshirt sophomore guard Duane Wilson had an especially productive first half after being benched by Wojciechowski to start the game in favor of freshman Traci Carter. Wilson went 3-for-6 from the field and scored a team-high ten points in the half. He also swished two three-pointers in the first half to bounce back from the 4-23 long-ball slump he had been mired in coming into the game. Simmons also had a productive first half. 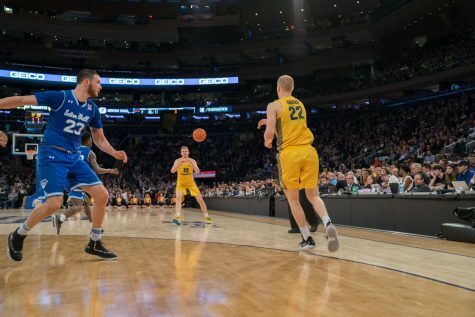 Ellenson and junior Luke Fischer held the consensus top recruit in the country to eight first-half points, but he pulled down eight rebounds and dished out four assists. 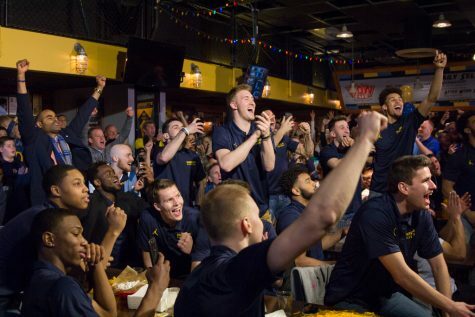 “We knew the ball was going to go through him to make plays and he did a good job,” Ellenson said. The only bugaboo for the Golden Eagles in the first half was their high number of turnovers. Marquette gave the ball away 13 times in the game’s first 20 minutes. Eight of the nine players that entered the game for Marquette in the first half committed at least one turnover, with Ellenson committing a team-high three miscues in the face of LSU’s smothering pressure defense. Those turnovers kept LSU in the game even as Marquette’s lead grew to as much as nine points several times in the second half. 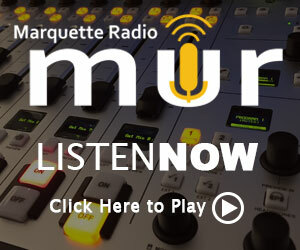 Simmons drew a foul from Ellenson with just under three minutes to go and sank a free throw, cutting the Marquette lead to five and giving Ellenson his fourth foul on the night. A minute later, Simmons drew a charge from Ellenson to send him to the bench for the night. Simmons sank the two ensuing free throws, and Marquette’s lead dwindled to 78-75 with 1:38 left. Simmons would strike again less than a minute later. 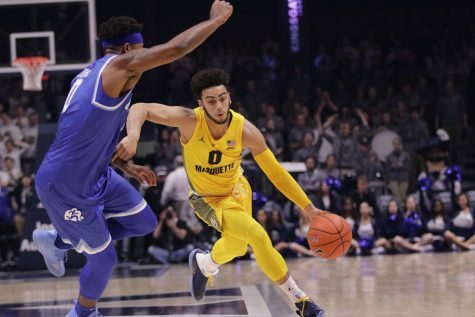 With Marquette up 79-77, he picked off an errant Haanif Cheatham pass and dished the ball to senior guard Josh Gray, who drew a foul and made one of two free throws to trim the deficit to one. 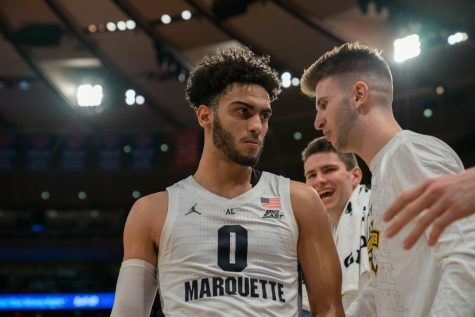 The highly touted freshman saved perhaps his finest work for Marquette’s ensuing offensive possession. Simmons tracked down an errant Duane Wilson three-pointer, then ran the length of the floor and banked in a heavily contested layup at the other end to give LSU their first lead of the game with 26 seconds left. Less than 30 seconds away from a 1-3 start and another painful loss, Wojciechowski decided to put the ball in the hands of junior shooting guard JaJuan Johnson, who drew a foul from Gray with nine seconds on the clock. 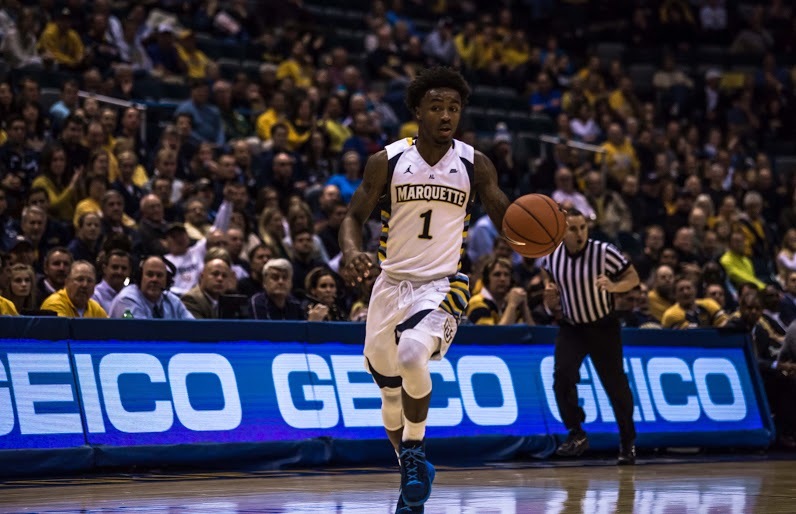 With the game on the line, Johnson casually buried both free throws to put Marquette up 81-80. LSU still had a chance to win the game with one final possession. 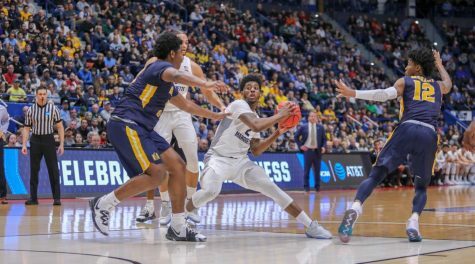 They shuffled the ball around and were able to get sophomore guard Jalyn Patterson open for a three-pointer on the right wing, but his shot clanged off the iron and Marquette held on for a huge victory. Fouls became a big issue for Marquette down the stretch. 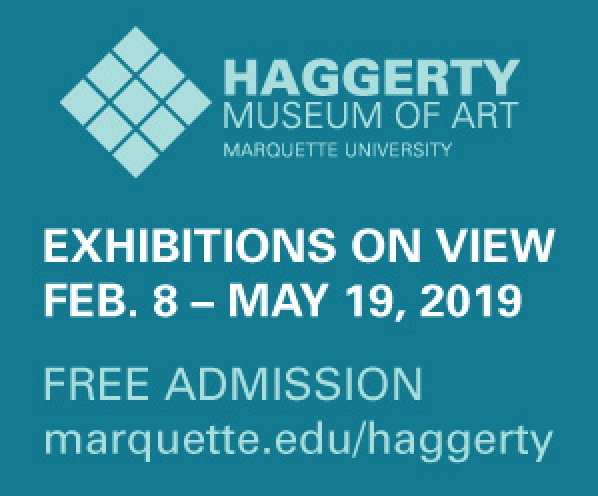 Both Henry Ellenson and Sandy Cohen fouled out of the game, and three other Marquette players had four fouls apiece by the final buzzer. Four different Marquette players scored in double figures. Fischer led the way with 19 points, while Ellenson, Wilson and Johnson each had 16. 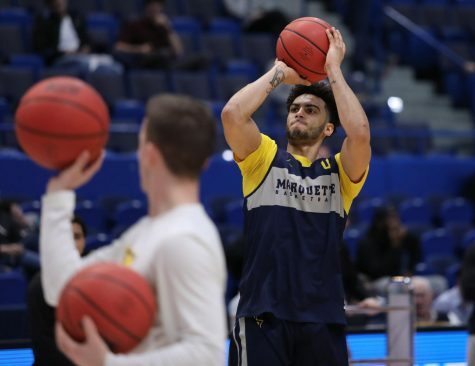 Marquette has been practicing in plain white t-shirts since their loss to Iowa, which is different from their usual Marquette gear. 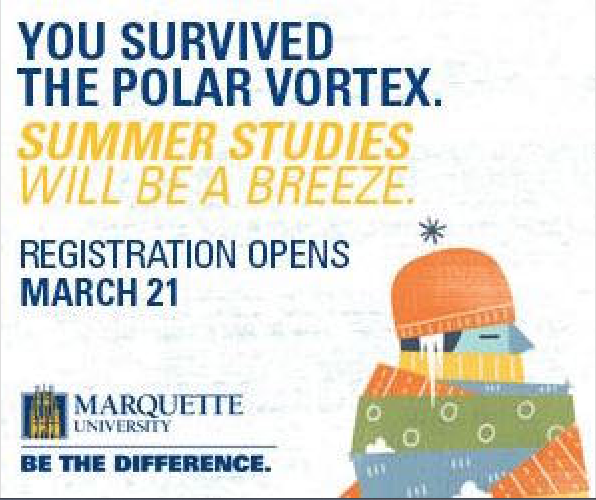 When asked why, Johnson said, “(Wojo) said we (haven’t) earned the right to have ‘Marquette’ across our chest.” The team has been practicing “old school” – at the Old Gym and on playgrounds – to capture the “Marquette” championship mentality. The win over No. 22 LSU marked Marquette’s first against a ranked opponent since defeating No. 21 Notre Dame on March 2, 2013 at the BMO Harris Bradley Center. It was also Wojciechowski’s first as a head coach.